This is one of the commonest mitre snails (family Mitridae) from the Indo-Pacific region and often encountered both intertidally and subtidally, normally hiding under large rocks or dead coral slabs. 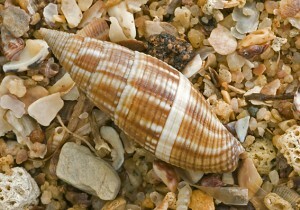 Mitres and their close relatives, Ribbed Mitres (family Costellariidae), have slender, high-spired shells. In general, mitres are smooth or spirally scupltured whereas ribbed mitres, as the name suggests, possess longitudinal ribs. The Variable Mitre, like other members of its family is predatory and feeds primarily on marine peanut worms. It grows to 40-60mm. Indo-Pacific: Subtropical and tropical Australia.